Paleo Oreo Style Cookies with Paleo 7 Minute Frosting! 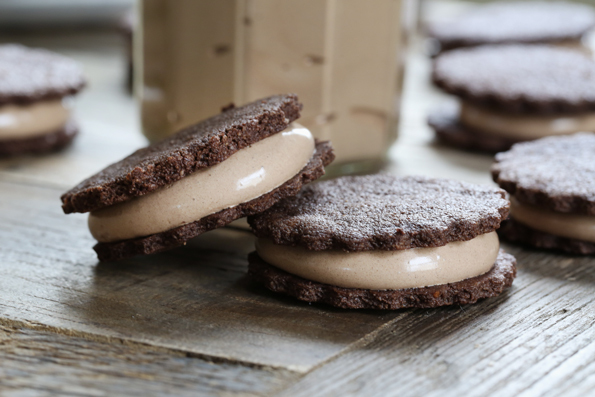 Crunchy Paleo chocolate cookies filled with Paleo 7-minute frosting to satisfy your sweet tooth, and still stay on your Paleo diet! 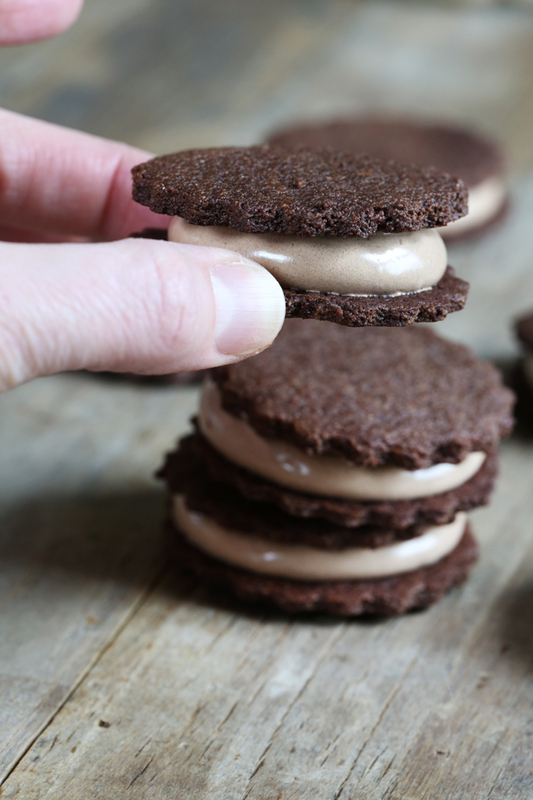 Free of refined sugar, nice and chocolatey but not too sweet, these chocolate Paleo cookies are the answer if you’ve been missing a crunchy chocolate sandwich cookie with a smooooooth filling. Paleo Oreo Style Cookies? Oh yeah. Keep your New Year’s resolution and have your cookies, too. My Paleo filling calls for granulated coconut sugar and some gelatin. If you’d like to try a version with maple syrup, this Seven Minute Maple Frosting (Paleo) from Healthy Seasonal Recipes looks worth a try. 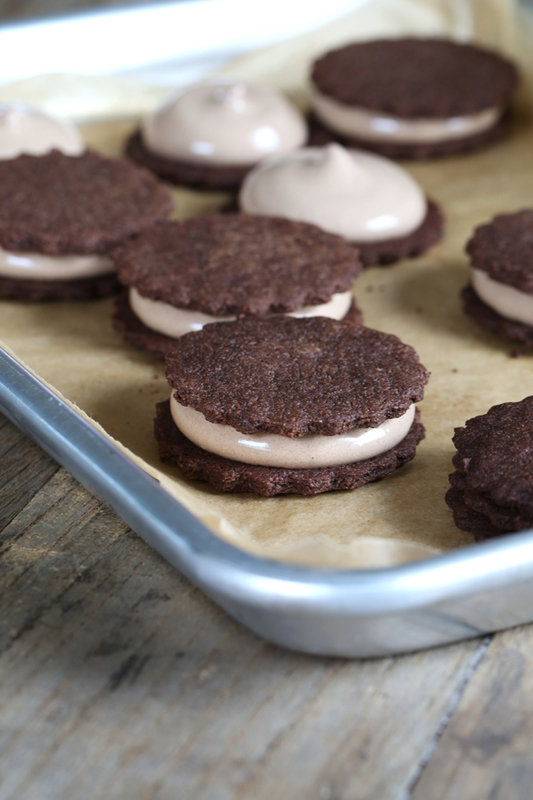 The cookie is like a Paleo chocolate shortbread cookie. Most Paleo baked goods are made with blanched almond flour, which is a very moist flour so it makes soft baked goods. Soft can be good! But sometimes? You want to bite into something crunchy, and for that, we need some starch. As excited as I am about the cookies, I might even be more excited about the filling. It’s the ever-popular 7-minute frosting (like we made for the gluten free champagne cake, well, before we turned it into swiss meringue buttercream, at least), but made … Paleo. The filling is made with a tiny bit of gelatin so that it is very stable at room temperature. A buttercream-style frosting would work as a filling, with finely ground coconut sugar and vegan shortening, but it would have been realllllly sweet. I wanted to try something different, even though I was pretty nervous that it wouldn’t work. The result? 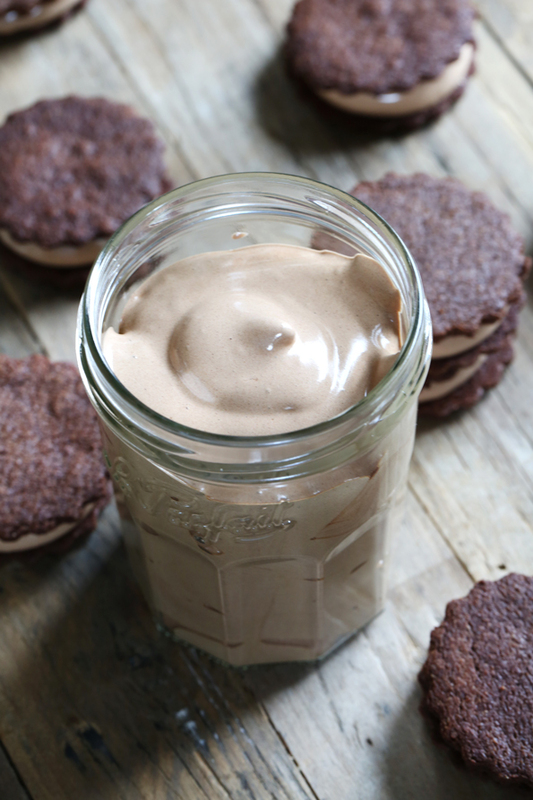 Lightly sweet, chocolate frosting that is as smooth and lovely as it is delicious. The dough is made in a food processor, and it starts out quite soft and, well, a bit oily. Just chill it a bit and it becomes very, very easy to work with. 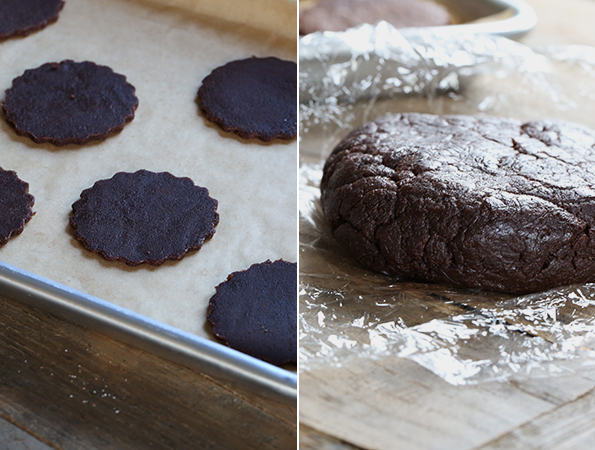 You could easily stop there and just make some crunchy Paleo chocolate cut-out cookies. Great for every occasion! Or …. you could fill them with this amazing frosting. I think you already know which way I lean. And you can bet Imma gonna make this frosting again and again, and play with other variations. It’s so light and fluffy, and naturally pretty low in sugar – especially compared to buttercream. Preheat your oven to 300°F. Line rimmed baking sheets with unbleached parchment paper and set them aside. Make the cookie dough. Place all of the ingredients for the cookies in a food processor in the order in which they are listed, and pulse until a dough forms. The dough will be soft and kind of oily. Turn out the dough onto a piece of plastic wrap, divide into two equal pieces and wrap each tightly. Place the dough in the refrigerator to chill for about 10 minutes. Shape and bake the cookies. Remove one piece of dough from the refrigerator, unwrap and roll out between two sheets of unbleached parchment paper until it is a bit more than 1/8-inch thick. With a 2 1/2-inch round cookie cutter, cut out rounds of dough. Place the rounds about 1 inch apart from one another on a prepared baking sheet and place the baking sheet in the freezer to chill for about 5 minutes (or the refrigerator for about 10 minutes) or until firm. If you find that it is difficult to work with the dough at any point, including difficulty removing the cut-outs to the baking sheet, simply chill the dough and it will become much easier to work with. Once the cut-outs are firm, place in the center of the preheated oven and bake until firm to the touch (about 15 minutes). If the cookies begin to smell nutty, take them out as they are about to burn. Allow to cool completely on the baking sheet. Make the filling. While the cookies are cooling, make the frosting. In the bowl of your stand mixer or a large bowl to be used with a handheld mixer, place the gelatin and bloom it in the 1 1/2 teaspoons water. In a medium-size, heat-safe bowl, place the egg whites, 1 tablespoon water and the 1 cup finely ground coconut sugar, and whisk to combine well. Place the bowl over a pot of simmering water and clip a candy thermometer to the side of the bowl, making sure the tip of the thermometer is in the liquid and not on the bottom of the bowl or you will get an inaccurate reading. The bowl should be just above the simmering (but not boiling water) without touching it. Cook the sugar mixture, stirring occasionally, until it reaches 160°F. Remove the bowl from the heat, and pour the mixture into the bowl of the stand mixer or large bowl with the bloomed gelatin. Beat with the whisk attachment for about 7 minutes or until the mixture is about tripled in size, thick and glossy. It will be a pale brown color because of the color of the sugar. Add the cocoa powder, and beat until combined and once again glossy. Assemble the cookies. Once the cookies are cool, place the frosting in a pastry bag fitted with a large plain piping tip (or just a large zip-top bag with the tip cut off), and pipe a dollop of the frosting on half of the cookies. 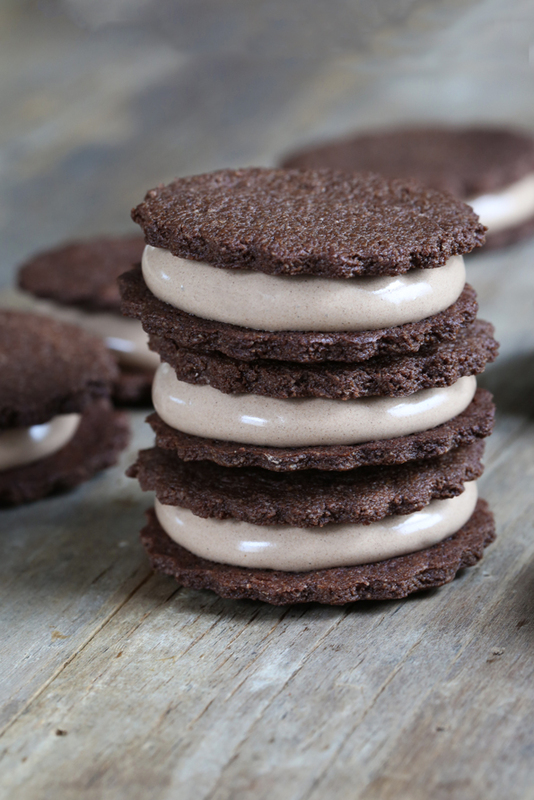 Allow the frosting to set for a minute or so until topping with the remaining cookies to make a sandwich. The filling will be set in about 10 minutes. P.S. Do you have your copy of Gluten Free on a Shoestring Bakes Bread? I’m going to be posting all the amazing reader-submitted photos of your bread creations from the new book this Friday. Send your photos to contact[at]glutenfreeonashoestring[dot]com! Don’t miss your chance to show off!! I have only one word for this . . . YUM! Okay, two more: Thank you! Hi Nicole.. any idea how long you can store these cookies (frosted)… and… when you say the filling will set.. does it set ‘hard’ like regular oreo filling or is it more creamy smooth… thanks. Hi, Richard, it’s creamy smooth, more like a mousse. It is very stable for days in the refrigerator or at room temperature. Hi Nicole, This is my first time posting. I recently bought your Bakes Bread and Quick and Easy cookbooks (and your first one for my father-in-law who is celiac, like me–have to borrow his!) and finally have all the ingredients I need to get started. I’ve been reading your blog for a couple weeks now–yours is my favorite GF cooking blog! I love your approach to flours (not one-size-fits-all) and love all the recipes you’ve shared. They all look amazing!! Love the photography on your blog, too. Just wanted to share my appreciation for all your hard work! Oh, and I was just thinking yesterday that I need to check your blog/books for an “Oreo” cookie for my kids since we’re starting them on a GF diet next week and they will certainly miss Oreos! (Their dad–and his dad 2 months ago) was just Dx with celiac disease and I was Dx’s 2 yrs ago–crazy, huh?! Their bloodwork was negative (but so was their dad’s and granddad’s), but we know the chances are great that they could develop celiac disease–and my son has some GI issues–hence a GF diet trial!) I look forward to participating in your blog community! These look delicious. Before I try them I was wondering if you think the dough can be rolled,into a log and sliced instead of cut with a cookie cutter? Also, do you think Nutella would work as an easy filling? I’m not sure about that, Rita. I think you’re best off rolling out the dough and using a cookie cutter, but feel free to experiment! Imagine living in a house where the mom is a food blogger and creates and tests recipes for a living? Nicole, will you adopt me? OhMyGoshOhMyGoshOhMyGosh!!!!! Totally making these cookies! Yes, I finally bought some Spectrum shortening; I couldn’t be left behind another second!!! And now I have EVERYTHING to make these right this very minute! Oh, so good, so bad, so good, so bad………………..why do you do this to me?!?!? That’s awesome, Chris! You won’t regret it. Paleo is kinda fun. Quite the challenge to develop interesting recipes, and then once you do … it’s extra cool! Interesting stuff! I tell you these cookies look awesome and I’m super intrigued with less sugar frosting…. you go girl!! I think you might really like the frosting, Jennifer. I think it would be beautiful on lots of other things, and it’s pretty stable at room temp because of the little bit of gelatin.